More than 200 Division B schools in Michigan competed in 23 events at their regional tournaments before 60 of those schools qualified for the annual Michigan Science Olympiad State Tournament April 29 at Michigan State University. The three schools that earned invitations to the MSO State Tournament from our region were Slauson Middle School, Clague Middle School, and South Arbor Charter Academy. Slauson placed fourth in the Middle School Division. The Slauson team poses for a group photograph. Photo by Marc Klinger. After attending many practice Invitationals in 2017, Slauson was primed to once again on March 25 to win the Regional 9 Tournament at Hillsdale College, finishing the day with an overall team score of 49 points, ahead of second-place team Clague (80 points), and third place team South Arbor Charter (106 points). The Clague Science Olympiad Team poses for a photograph. 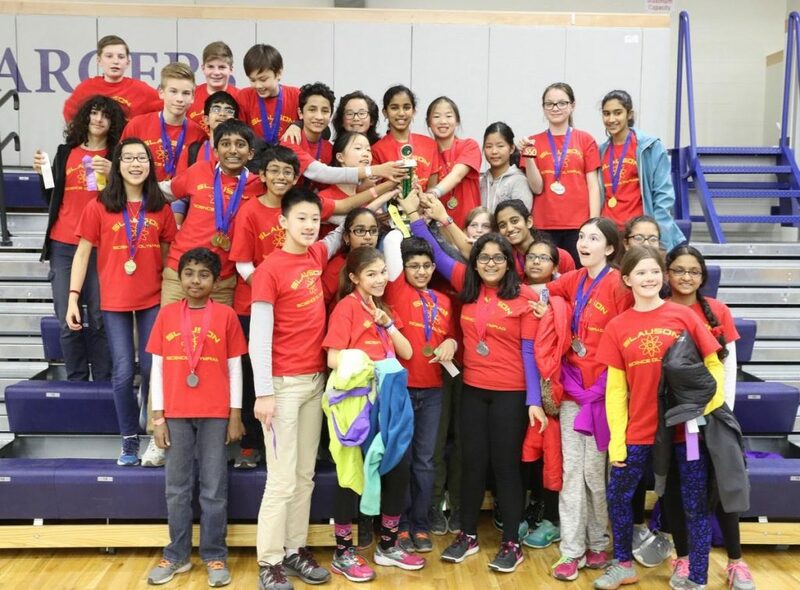 Clague Science Olympiad attended three invitational tournaments this year, where at Holt they finished second to the 2016 national champions, Daniel Wright Junior High School from Illinois. Then, at the Regional Tournament, Clague finished second to Slauson, and came home from Regionals with first place medals for Experimental Design, Food Science, Invasive Species, Microbe Mission, and Optics; a second place medal for Rocks & Minerals; and third place medals for Anatomy & Physiology, Crime Busters, Ecology, Fast Facts, Meteorology, Reach for the Stars, and Wright Stuff. First place: Ecology (Benjamin Pollitz, Aakarsh Verma); Third place: Meteorology (Benjamin Pollitz, Timothy); Fifth place: Crime Busters (Heidi Miao, Natalie Mycek-Card); Sixth place: Reach for the Stars (Timothy, Aakarsh Verma). Anatomy & Physiology (Varun Krishna), Bottle Rocket (Neela, Crystal Wu), Disease Detectives (Varun Krishna, Natalie Mycek-Card), Dynamic Planet (Eileen Su, Angie Zhou), Experimental Design (A. G., Anon., Benjamin Pollitz), Fast Facts (A. G., Neela), Food Science (Heidi Miao, Natalie Mycek-Card), Hovercraft (Eileen Su), Invasive Species (A. G., Angie Zhou), Microbe Mission (Varun Krishna), Mission Possible (A. G., Anon. ), Optics (Anon., Aakarsh Verma), Road Scholar (Anon., Aakarsh Verma), Rocks & Minerals (Timothy, Benjamin Pollitz), Scrambler (Eileen Su, Neela), Towers (A. G., Angie Zhou), Wind Power (Divija Chandupatla, Neela), Wright Stuff (Benjamin Pollitz, Timothy), and Write It, Do It (A. G., Angie Zhou). Clague Science Olympiad Coach thanks Principal Che Carter, office professional Laura Hannaford and science teacher Soon Morningstar for all their support this year, as well as the Clague PTSO and the Ann Arbor PTO Thrift Shop for their financial support.